Members of the Port St. Lucie Amateur Radio Association are available to provide assistance to individuals wishing to obtain an amateur radio operator's license. We can also help with obtaining study materials, mentoring, providing classroom training and offering license examination sessions. Our most popular training program is a 2-day technician level program held over a single weekend. This program involves self-study by the student followed by eight hours of classroom review on Saturday, followed by an additional 4 hours of classroom review on Sunday. It culminates in a licensing exam session on Sunday afternoon. Classes and review sessions for all license levels are offered by the PSLARA training team on an as needed basis. We typically require a minimum of six candidates to schedule a training session. If you are interested in earning your license and/or participating in one of our training sessions, please send an email to: classes@pslara.com. Be sure to provide your name, street address, telephone number and email address. Your name will be added to our list and we will notify you when we have sufficient candidates to schedule a class. Our training programs are offered at no cost to the student by our volunteer trainers. The only expenses incurred by the student will be for the purchase of the recommended study manual and the mandated $15 fee to take the license exam. While waiting for a formal class to be scheduled, consider utilizing some of the many self-study resources available on the internet. Just google "Amateur Radio License Study" for a list of resources. In addition, here are three links that will take you to the FCC Question pools for each license class: Technician, General and Extra. Reviewing the question pool will give you a heads-up on exam day because the questions you will see on your test are drawn directly from the question pools. The technician and general license exams consist of 35 questions. The extra class exam consists of 50 questions. PSLARA's VE Licensing Team typically holds scheduled testing sessions on the second Saturday of the following months: January, March, April, May, June, July, August, September, November and December. All sessions begin at 8:30 AM. All sessions except April are held at the St. Lucie County Emergency Operations Center, located at 15305 West Midway Road adjacent to the St. Lucie County Fairgrounds at the intersection of Midway Road and Okeechobee Road. At every session, testing is available for all classes of amateur radio licenses. Testing sessions are conducted by PSLARA members who are ARRL accredited Volunteer Examiners (VE's). Tests are graded immediately upon completion by the VE team. If a passing score is obtained a Certificate of Successful Completion of Examination (CSCE) is issued to the applicant. The VE team then submits the paperwork to ARRL who coordinates with the FCC to issue the official license. New licenses are typically awarded within one to two weeks following the exam date. Saturday, August 10, 2019 9:00 AM FPARC HamFest, Indian River State College, 35th St. & Okeechobee Rd. Please be present and seated by the scheduled start time to begin the paperwork. Doors will be closed about fifteen minutes after the official start time when the formal testing begins. A valid government issued photo ID (driver's license, state issued ID, passport, etc.). If a photo id is not available, then a certified birth certificate (with raised seal) and one additional proof of identification and residence address must be provided. A recent utility bill or tax bill in applicant's name and address will suffice for the second proof of identification. 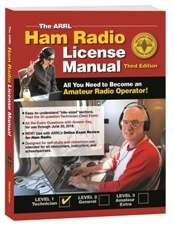 The original and one copy of your current amateur radio operator's license, if any. The original and one copy of any valid CSCE (Certificate of Successful Completion of Exam) as credit toward the next level license, if any. The license fee of $15.00 in cash or check. If paying by check, make the check payable to ARRL/VEC. Two #2 pencils with erasers and a black or blue ball point pen. For additional information on PSLARA's VE test sessions, send an email to testing@pslara.com. Be sure to include your name, street address, telephone number and email address. Alternately, you can contact our coordinator of testing, Robert (Bob) Brown, KJ4UXS at brownpsl@comcast.net, or by telephone at: 772-201-5485. A handicap or disability should not prevent a qualified candidate from obtaining an amateur radio operator’s license. If a disability or other special circumstance prevents a candidate from attending a regularly scheduled license exam session, just let us know. The American Radio Relay League, which is the governing body for our team of volunteer examiners, allows us to bring the examination session to the special needs candidate. Obviously, prior arrangements will need to be made for a special exam session. For further information contact Robert (Bob) Brown, KJ4UXS, at brownpsl@comcast.net, or by telephone at 772-201-5485.